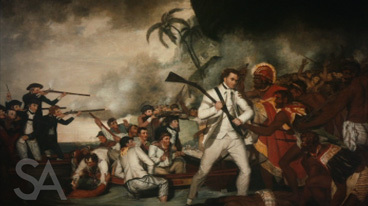 Video clip synopsis – Captain James Cook’s untimely return to Hawaii ended with his violent death, the details of which are portrayed in numerous conflicting illustrations. Broadband MP4 ccdeath_bb.mp4 (19.1MB), suitable for iPods and computer downloads. Captain James Cook’s untimely return to Hawaii in 1779, 10 days after he had left, ended with his violent death, the details of which are portrayed in numerous illustrations in the National Library collection. Many artists, including the official artist for the voyage, John Webber, recreated the scene in the years following Cook’s death. Each artist portrayed a different view: Cook the white knight, Cook the peacemaker, Cook the leader of a military offensive. But we know that Webber didn’t witness the death so it seems likely that an engraving made from the drawings of DP Dodd and other witnesses are more likely to represent what really happened. Students are encouraged to view Episode 5 of Hidden Treasures entitled Captain Cook in Hawaii. Taken together, they help us to explore the nature of and reasons for Cook’s death in 1779. Your task is to use the information in the programs to create a narrative or a storyboard that sets out the sequence of events, explains the reasons for, and comments on the degree to which we can be certain about the events of Cook’s death. Which action of Cook’s destroyed the illusion that Cook represented Orono? Look at the different representations of Cook’s death in the segment. What message does each give about his death? All were painted after the event and none was painted by an eyewitness. How does that influence the nature and purpose of the paintings? You might be assisted in this by first reading the account of his death. This account by ship’s surgeon, David Samwell, is regarded as the most complete and reliable one. List the elements that contributed to the cause of Cook’s death. For example, you might include the date and time—if Cook had landed earlier or later things might have been different. You might list Cook’s character—if he had not been so confident he might have behaved with greater caution. You might list the illness of Clerke—if he had led the party as Cook originally intended then Cook would not have been on the beach at the time of the attack. And so on. From the list that you make, create a statement about the nature of causation in history.